The 2018 Undoing Aging Conference is focused on the cellular and molecular repair of age-related damage as the basis of therapies to bring aging under full medical control. The conference provides a platform for the existing science community that already works on damage repair and at the same time offers interested scientists and students a first-hand understanding of the current state of this exciting new field of biomedical research. Speakers will include leading researchers from around the world focused on topics including stem cells, senescent cells, immunotherapies, biomarkers and drug discovery. Undoing Aging is not only open to the scientific community but also welcomes all interested members of the broader Life Extension community. 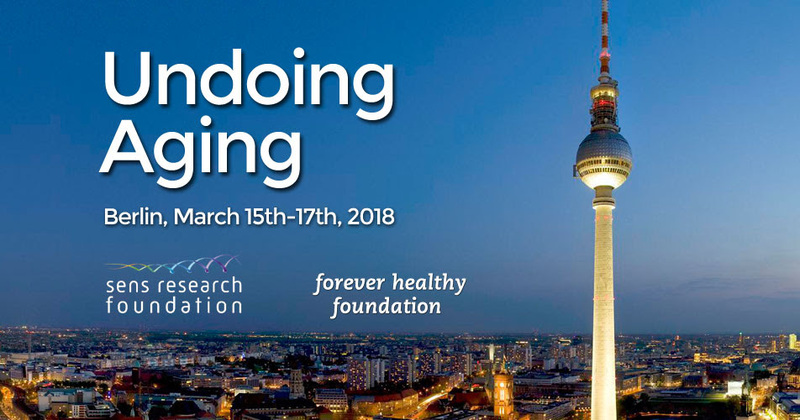 The conference, which is a joint effort of the SENS Research Foundation and Michael Greve’sForever Healthy Foundation, takes place March, 15 – 17 in Berlin. Undoing Aging will include poster sessions on the first two evenings. If you wish to present a poster, please submit the details here.